Wondering if it’s time to replace your home’s air conditioner or furnace? Turn to the Pittsburgh HVAC pros at Top Notch Heating & Cooling. If repairs alone aren’t enough, and a replacement unit is necessary, we are proud to recommend Goodman® products to Pittsburgh-area homeowners. The Goodman brand has been synonymous with affordable, reliable, and high-quality heating and cooling equipment since 1982. For over three decades, Goodman ACs and furnaces have kept many homes throughout the U.S. comfortable year-round. Here are a few reasons we like Goodman HVAC products and why we feel you will, too. Goodman air conditioners and gas furnaces are made right here in the good ‘ole U.S.A. Unlike Carrier, Goodman is choosing to keep jobs here at home rather than outsource them internationally. The parent company of Goodman, Daikin Industries, Ltd. is in the process of completing a new manufacturing facility in Texas. This 4 million square foot industrial plant, located in Waller County – just about 40 miles outside of Houston, TX – will provide a projected 5,000 jobs by the end of 2018. Practically all Goodman HVAC products will pass through this facility. This means when you invest in a Goodman air conditioning unit, or a Goodman gas furnace, you’re investing in America. We at Top Notch Heating & Cooling believe that a company that harnesses the innovation and productivity of American workers is one worthy of our recommendation. We also love that Goodman is all about their customers. They manufacture efficient and reliable products. Through the years, Goodman has invested well over $100 million in advanced manufacturing equipment and assembly line technologies. Their commitment to producing quality products is unparalleled. It makes our commitment to Goodman a no-brainer for us. 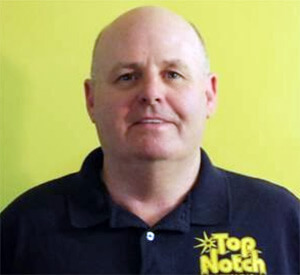 The pros at Top Notch Heating & Cooling understand Pittsburgh-area homeowners want just the right balance of optimal temperature control, improved indoor air quality, dependable and reliable operation, and maximum energy savings. Many would assume that getting all of these things would require a significant investment. When we recommend a Goodman AC or Goodman furnace, you can rest easy knowing that you’re getting all of the above at an unbelievably affordable price. And just wait until you start seeing lower utility bills once these energy efficient units are installed + up and running. Many of the policies and manufacturing processes implemented by Goodman are centered on energy efficiency and environmental sustainability. All Goodman air conditioning units or heat pumps contain a chlorine-free R-410A refrigerant rather than ozone-depleting hydrochlorofluorocarbons (HCFCs). The manufacturing standards at Goodman have earned them the recognition of the International Organization for Standardization (ISO). Goodman’s office is also on track to achieve LEED Gold Certification for a space that promotes reduced energy consumption. Goodman as a whole is consistently compliant with all relevant environmental standards and health/safety regulatory requirements. Every employee, contractor, and vendor associated with the company must support its safety, health, and environmental initiatives. All Goodman products list the unit’s Annual Fuel Utilization Efficiency (AFUE) ratings, Seasonal Energy Efficiency Rating (SEER), and Heating Season Performance Factor (HSPF) for complete transparency. 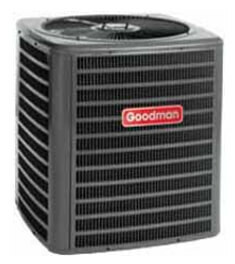 There’s perhaps no bigger name in home cooling than Goodman. 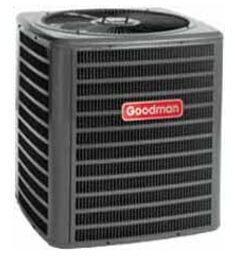 Goodman AC’s are energy efficient, highly durable, incredibly reliable, and affordable. Whether your home is big or small, Top Notch Heating and Cooling has the perfect Goodman air conditioner to keep you cool. Even on the hottest and most muggy of summer days, Goodman brand air conditioners will keep your home cool and comfortable while also keeping your energy costs down. There’s absolutely no need to have to choose between optimum cooling comfort, durability, and affordability – not when you can get all three from a Goodman air conditioning unit. Not to mention you’re also getting some of the best warranty protection in the HVAC industry. As you assess the various Goodman brand air conditioning units available, always remember that the most energy-efficient systems are the ones with higher SEER numbers. Here are a few Goodman AC units we offer here in Pittsburgh. 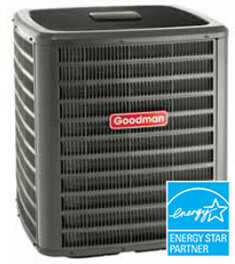 With a SEER up to 18, the Goodman DSXC18 is the highest efficiency air conditioner in their product line. There are three models in this split-system series with cooling capacities anywhere from 34,000 to 56,000. All models have a two-stage operation and are certified by the Air Conditioning, Heating, and Refrigeration Institute (AHRI). Other features of the DSXC18 include a high-density foam compressor sound blanket, a Copeland scroll compressor, and a very quiet condenser fan motor and sound control. This unit runs amazingly quiet for as strong as its cooling power is. It’s hard to find anything this quiet, effective, and energy efficient at such a great price. Most Top Notch customers we’ve installed a DSXC18 AC for are extremely satisfied with this air conditioning unit. Click Here for more info and specs on the Goodman DSXC18 AC or check out Goodman’s Consumer Brochure. This split-system air conditioner has an efficiency that goes up to 16 SEER. The Goodman DSXC16 has a two-speed condenser motor, a two-stage Copeland scroll compressor, and a foam sound blanket for incredibly quiet operation. The DSXC16 is also equipped with coil and ambient temperature sensors, low-and-high pressure switches, plus a factory-installed filter drier for greater longevity. Also built into the unit are expanded ComfortAlert diagnostics, diagnostic indicator lights, and the storage of six fault codes. This unit is also compatible with the ComfortNet Communications System for remote control monitoring and access. Click Here for more info and specs for the DSXC16 Goodman AC or review Goodman’s Consumer Brochure. This split-system AC has an efficiency rating up to 16 SEER. Features include a copper tubing coil and a corrugated aluminum fin coil that offer extremely efficient heat transfer. A single-stage compressor adds even more efficiency. A factory-installed filter drier protects this compressor from debris and moisture. As with most Goodman ACs, a quiet condenser fan system plus louvered sound-control means this unit runs quietly. Top Notch customers we’ve installed a GSX16 AC unit for in Pittsburgh love its great value, quiet compressor, good performance, and overall reliability. Click Here for more info and specs on the Goodman GSX16 AC or take a look at Goodman’s Consumer Brochure. 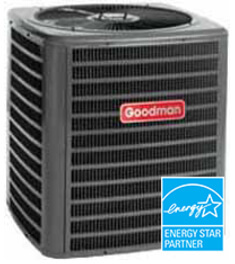 This single-stage Goodman air conditioning unit has a 14 SEER efficiency rating. Features of the Goodman GSX14 include a copper tube and aluminum fin coil for greater efficiency. A factory-installed filter drier keeps the unit clear of moisture, contaminants, and debris. A three-bladed fan and louvered sound-control can take sound levels down to 73 decibels. Homeowners we’ve installed a Goodman GSX14 AC for appreciate its cost-effectiveness and reliability. Click Here for more info and specs for the Goodman GSX14 AC or check out the Consumer Brochure. The Goodman GSX13 AC is a three-phase 13 SEER split-system. Models range from 1.5 to 5 tons in capacity and produce 18,000 to 60,000 BTU/H. Goodman’s Smartcoil technology enhances the GSX13’s heat transfer abilities. Refrigeration-grade 5 mm rifled copper tubing and aluminum fins contribute to a larger-than-normal surface area. Protecting this coil is a steel louvered guard. Operating noise is significantly reduced by the unit’s quiet condenser fan system and louvered sound control. The unit’s cabinet includes a side panel with access to controls and enough space to store accessories. Click Here for more info and specs for the Goodman GSX13 AC or review the Consumer Brochure. Want to stay warm yet still save money through even the most difficult of Pittsburgh winters? The variable and multi-speed Goodman brand gas furnaces provide optimum indoor comfort. The best kind of gas furnace is one that runs efficiently and quietly all winter long. These are the kinds of furnaces that Goodman specialize in. 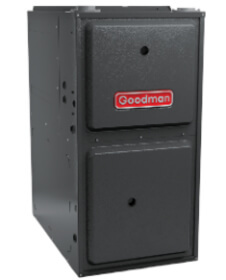 Goodman branded gas furnaces come loaded with features specifically added to provide years and years of outstanding performance. 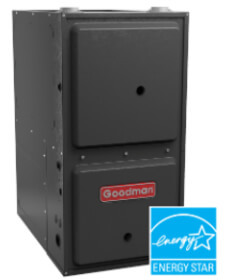 Goodman furnace units are priced to accommodate most budgets and the brand’s energy efficient technology also translates into lower utility bills. 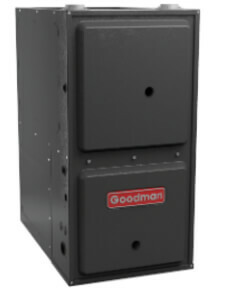 Additionally, Goodman brand furnaces have some of the best warranties in the heating and cooling industry. You’d be hard pressed to find a gas furnace capable of delivering this kind of energy efficiency, savings, and no-risk investment. As you’re assessing Goodman furnaces, remember that the units with higher AFUE ratings are the most energy efficient for maximum savings. Here are a few of our most recommended Goodman furnace units in Pittsburgh, PA. 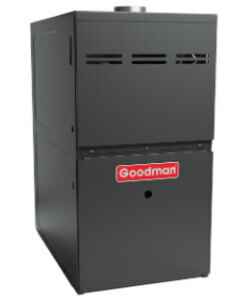 The Goodman GMVM97 is a modulating variable-speed gas furnace. This unit has up to a 98% AFUE rating. It is Energy Star qualified and designed specifically for multi-position (upflow, horizontal left, horizontal right) installation. Features of the GMVM97 include a heavy-duty aluminized-steel tubular heat exchanger as well as a secondary stainless-steel heat exchanger. Tremendous noise reduction is achieved thanks to a fully insulated heat exchanger and blower section. The GMVM97 is compatible with the ComfortNet Communicating System; communicating with both single-and-two-stage thermostats. Another feature of the GMVM97 is a self-diagnostic control board which allows for continuous system monitoring. This board also has a fault code history output with a 7-segment display for quick and easy troubleshooting. The GMVM97’s cabinet is built with heavy-gauge steel. It is fully insulated to minimize both heat loss and operating noise. Click Here for more GMVM97 Goodman furnace info and specs or review the Consumer Brochure. 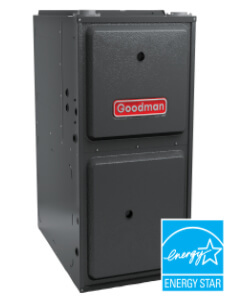 The GCVM97 Goodman gas furnace is a modulating variable-speed unit with up to 98% AFUE. It features a heavy-duty-aluminized-steel tubular and stainless-steel heat exchangers. The GCVM97 is ComfortNet Communicating System compatible communicating with single-stage-and-two-stage thermostats. Quick and easy troubleshooting is made possible by a self-diagnostic control board with a fault-code history output to a 7-segment dual display. The GCVM97 is built for multi-purpose downflow, horizontal left or right installation. It runs quietly and efficiently with a fully insulated heat exchanger and blower section plus multiple continuous fan speed options and enhanced dehumidification modes. 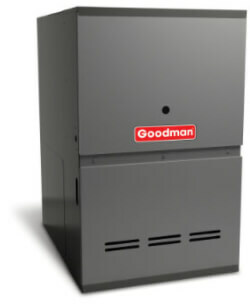 Click Here for more Goodman GCVM97 gas furnace info and specs or review the Consumer Brochure. The GMVC96 Goodman furnace as an AFUE performance up to 96%. It features aluminized-steel-tubular heat exchangers and a variable-speed circulator motor for efficient and quiet performance. Even more quiet air circulation is made possible by multiple continuous fan speed options. The GMVC96 is designed for multi-position installation — upflow, horizontal right or left. GMVC96 units are compatible with the ComfortNet Communications System. A self-diagnostic control board allows for relatively easy troubleshooting. Click Here for more info and specs for GMVC96 Goodman furnaces or review the Consumer Brochure. The GCVC96 is a two-stage, variable-speed ECM gas furnace with up to 96% AFUE. Its two-stage gas valve enables quiet, economical heating. This unit is compatible with the ComfortNet Communicating System – communicating with both single-stage-and-two-stage thermostats. A self-diagnostic control board simplifies troubleshooting. The GCVC96 unit is designed for downflow, horizontal left or right multi-position installation. Click Here to learn more about the GCVC96 Goodman gas furnace or review the Consumer Brochure. The GMEC96 is a two-stage, multi-speed gas furnace with up to a 96% AFUE. The multi-speed ECM blower motor means optimal energy-efficiency. Other features include a heavy-duty aluminized-steel tubular heat exchanger plus a secondary stainless-steel exchanger. Quiet economical heating is made possible by the unit’s two-stage gas valve. Other features of the GMEC96 are a durable silicon nitride igniter, a quiet two-speed induced draft-blower, low continuous fan speed options, multi-position installation — upflow, horizontal left or right, and a self-diagnostic control board. Click Here for more GMEC96 Goodman Furnace information and specs or review the Consumer Brochure. The GCEC96 is a two-stage, multi-speed ECM gas furnace with an AFUE up to 96%. Its multi-speed ECM blower motor is very energy efficient. There’s a primary tubular heat exchanger made of aluminized-steel and then a secondary heat exchanger made of stainless-steel. The GCEC96 unit is designed for downflow, horizontal left or right multi-position installation. It features a convenient left or right gas and electrical service connection, a self diagnostic control board, a quiet two-speed induced draft blower, and durable silicon nitride igniter. Click Here to see more product specs for the GCEC96 Goodman Furnace or review the Consumer Brochure. 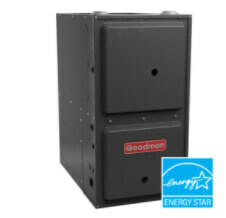 The GMSS96 is a single-stage, multi-speed Goodman gas furnace with up to 96% AFUE. It’s designed for multi-purpose installation — upflow, horizontal right or left, and certified for both direct and non-direct vent. There is easy, simple access to both top and optional side venting. Other GMSS96 unit features include a primary aluminized steel tubular heat exchanger and secondary stainless steel heat exchanger. The heat exchanger and blower sections are fully insulated for quiet operation. Gas and electrical connections are available on both the unit’s left and right side. A self-diagnostic control board with LED output makes troubleshooting easy. 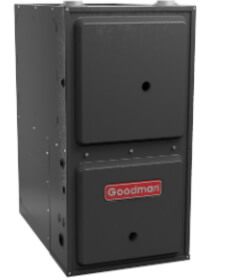 Click Here to learn more about the Goodman GMSS96 single-stage, multi-speed gas furnace. Or review the Consumer Brochure. The GCSS96 is a single-stage, multi-speed gas furnace with an AFUE up to 96%. It has many of the same features as the GMSS96 except it is designed for downflow, horizontal left or right multi-purpose installation. This unit has a single-stage gas valve, a quiet single-speed induced draft blower, a silicon nitride igniter, and a self-diagnostic control board with a constant memory fault code history. 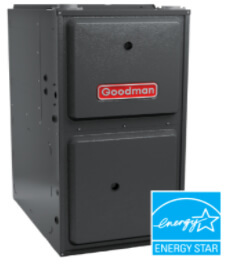 Click Here to learn more about the GCSS96 Goodman furnace or review the Consumer Brochure. The GMSS92 is a single-stage, multi-speed gas furnace with an efficiency up to 92% AFUE. In addition to its single-stage gas valve and multi-speed blower, is a quiet, single-speed induced draft blower, self-diagnostic control board, a durable silicon nitride igniter and aluminized-steel and stainless-steel heat exchangers. There’s convenient left or right gas and electrical service connections and a multi-position installation design. The GMSS92 is designed for multi-position installation — upflow, horizontal left or right. 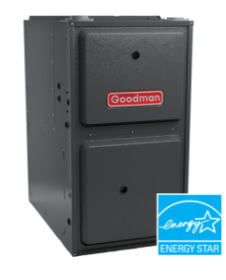 Click Here to learn more about the GMSS92 Goodman Gas Furnace or review the Consumer Brochure. The GCSS92 is a single-stage gas valve, multi-speed blower gas furnace with up to a 92% AFUE. The GCSS92 features a heavy-duty aluminized-steel tubular primary heat exchanger and a secondary stainless-steel heat exchanger. It is certified for direct (2-pipe) or non-direct (1-pipe) vent and has gas and electrical service connections on both its left and right side. The GCSS92 is designed for multi-position installation — downflow, horizontal left or right. 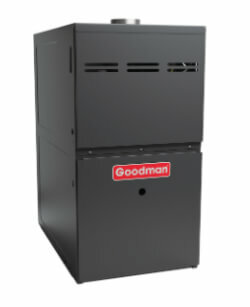 Click Here to learn more about the GCSS92 Goodman Furnace or review the Consumer Brochure. The GMVC8 unit is a two-stage, variable speed gas furnaces with an 80% AFUE performance efficiency rating. Its two-stage gas valve operates on both single-stage or two-stage thermostats. This unit also features the SureStart silicon nitride igniter for an extended igniter life. The GMVC8 unit’s two-speed induced draft blower is quiet. It has a quiet variable speed ECM circulator that gently ramps up or down based on heating demand. Its low constant fan speed quiety circulates air throughout your home. The furnace control board features self-diagnostics and electronic air cleaner/humidifying provisions. The GMVC8 is built for multi-position upflow, horizontal left or right installation. 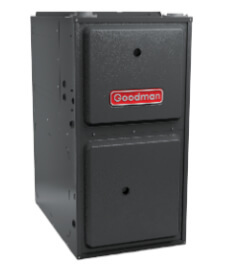 Click Here to learn more about the Goodman GMVC8 Gas Furnace or review the Consumer Brochure. The GCVC8 is identical to the GMVC8 except it’s designed for a downflow, horizontal left or right multi-position installation. This two-stage, variable-speed gas furnace has an 80% AFUE. The GCVC8 unit’s heavy-gauge steel cabinet is fully insulated with a highly durable baked-enamel finish. The unit has a removable bottom for bottom or side return applications. It also has a convenient right or left connection for gas/electric service. The GCVC8 runs efficiently and quietly. The unit’s self-diagnostics control board makes troubleshooting easy. The SureStart silicon nitride igniter is designed for a longer igniter life. Click Here to learn more about the GCVC8 Goodman furnace or review the Consumer Brochure. The GMH8 and GDH8 units are two-stage convertible, multi-speed gas furnaces with an AFUE of 80% The GMH8 is built for multi-position installation — upflow and horizontal right or left. The GDH8 – while identical – is built for dedicated downflow. One feature of the these units is the two-stage convertible gas valve, which automatically adjusts to a low or high stage. Another feature is its self-diagnostic control board, which allows for the continuous monitoring of furnace operation. The heavy-gauge steel cabinets of these units have baked-enamel finishes. Their heat exchanger and blower sections are also fully insulated. Click Here to for more information and specs for GMH8 & GDH8 Goodman furnaces or review the Consumer Brochure. The Goodman GMS8/GDS8/GHS8 gas furnaces have an 80% AFUE rating. In comparison to more recently manufactured furnaces, these units are relatively low-efficiency. Each of the units features a durable hot surface mini-igniter, a foil faced insulated heat exchanger, a corrosion-resistant blower, a tubular heat exchanger, and a self-diagnostics control board. The GMS8/GHS8 models are built for multi-position upflow, horizontal left or right installation. The GDS8 is designed for dedicated downflow installation. Click Here to learn more about the GMS8/GHS8/GDS8 Goodman gas furnaces or check out the Consumer Brochure. Top Notch Heating & Cooling is pleased to be one of the premier dealers of Goodman HVAC products in Pittsburgh. Goodman is a name you can trust and a product you can believe in. Our technicians pride themselves on their accurate evaluation of your specific needs and solutions. You’re entrusting us with your home’s year-round comfort. You’re taking our word for what is or what isn’t the best solution for your specific indoor comfort needs. When our techs recommend Goodman products to you, they trust that the product they’re recommending will perform for you day in and day out year after year. Our company’s reputation is at stake. Thankfully, our customers throughout Western Pennsylvania are almost unanimously happy with the performance of any Goodman product we’ve installed for them. They also love that Goodman offers some of the best warranties in the industry. Parts like a furnace’s heat exchanger are covered with a Lifetime Limited Warranty to the original registered homeowner. If a heat exchanger fails during your first decade of home ownership, the entire unit can be replaced as long as you still own the home. There are also a number of 10-Year Limited Parts Warranties for functional furnace and air conditioner parts. We highly encourage you to glance at the Consumer Brochure of each item above to review the specifics of each product’s warranty. If you’d like to talk to one of our Pittsburgh HVAC technicians about replacing or installing a new Goodman gas furnace or air conditioning unit, give us a ring today at 412-381-0598.